A Lawrence County, Ohio, couple is suing Huntington Realty Corp. and Huntington Masonic Temple Association for an elevator malfunction. On April 24, 2009, Chrystal Shepherd was in an elevator on the defendants’ property when it malfunctioned, according to a complaint filed Nov. 12 in Cabell Circuit Court. Shepherd claims the elevator fell about two stories before coming to an abrupt halt, rising briefly and then falling another short distance. 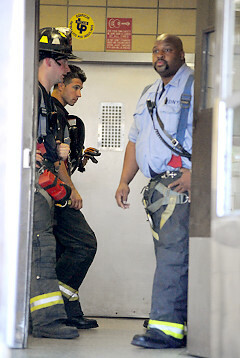 After the elevator’s fall, Shepherd was trapped in the elevator for an extended period of time due to the failure of the doors to open and failure of the emergency communication equipment in the elevator to operate, according to the suit. Shepherd claims she eventually was rescued by the Huntington Fire Department which responded to the scene only after individuals in the building heard her cries of distress and called for assistance. While waiting in the elevator for assistance to arrive, Shepherd “noted that the inspection card posted by the State of West Virginia indicated that the elevator was four months overdue for periodic inspection,” the complaint states. Shepherd claims the defendants failed to properly inspect and maintain the elevator.